BSNL Giving Tough Fight To Reliance Jio New Plan: BSNL Launch New Recharge Plan Offer After Jio Recharge Plan Launched: BSNL is giving a tough fight to Reliance Jio Recently in festival season, Reliance Jio has launched theirs to two recharge plan for the customer. Now BSNL has updated its FTTH (Fiber to the Home) Broadband Plans, BSNL has now come up with the Recharge Pack of 1,097, which will include 25GB of data besides unlimited voice calls. The validity of this plan is 365 days. This plan will be available till 6 January 2019. 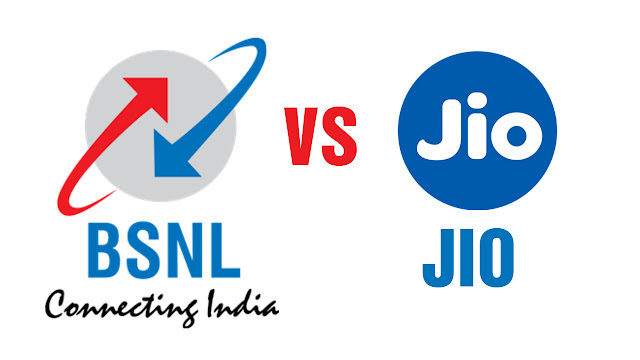 BSNL Reliance Jio of this plan will have a tough fight with the Rs 1,699 plan. This plan also has a validity of 365 days i.e. one year. However, it provides data benefit of 547.5 GB. I.e. 1.5 GB per day. In addition to Unlimited voice calls in Jio Rs. 1,699 plan, 100 SMS are available free per day. Also get complimentary subscriptions for the Jio customer. According to BSNL's official website, this recharge plan of 1,097 is currently available for customers of Kolkata. Apart from Delhi and Mumbai, free message, unlimited local, STD and roaming voice calls will be available throughout the country. It will also get 25 GB data for one year. That is, every day will get only 70 MB of data.